In reading the first issue of DC Rebirth, the thing that stood out to me the most was probably one of the smaller things that has been missing from the DCU since the New 52. Green Arrow and Black Canary’s relationship. Steady relationships in comics are tough to pull off because the characters, by nature, live a duel existence. So having a significant other that only shares one half of your life would be difficult. Superman and Lois Lane worked for so long because they both were pushing for making the world a better place, Lois just did it without a cape. It’s the same reason Superman and Wonder Woman didn’t work. She is his equal in costume, but she has no equivalent to his Clark Kent side. Wonder Woman would make more sense for Batman as both Bruce Wayne and Diana Prince are more facades than people. GA and BC work because they connect on both the costumed adventure and everyday level. And unlike some heroes, Green Arrow works better when he has someone to aim him. A Yin to his Yang. We saw that for years with his teaming up with Green Lantern and it continued with Black Canary. And with Canary, he has a partner, not someone he feels he has to protect from the dangers that exist in his vigilante world. It’s a relationship that works and comic fans have been wanting back. It adds a dynamite to both characters that is lacking when they are apart. So why didn’t it work on Arrow? Simple, we spent a few seasons with Laurel Lance not Black Canary. All those episodes of her being someone Oliver Queen needed to protect. Where Felicity Smoak and later Sara Lance were both introduced as capable of helping in his crusade and someone he didn’t have to lie to and keep that part of him hidden from. Laurel was kept out for years and when the writers finally let her in on the secret, the ship had already sailed. 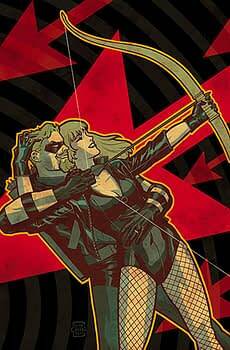 I think when Green Arrow and Black Canary are together, both of the characters are at their best. And regardless of what else DC is changing with Rebirth, at least they’re correcting this one.